These are for my great-nieces for Christmas. Both are a-line dresses but the Kayla buttons at the shoulders and the Lillian buttons down the back. 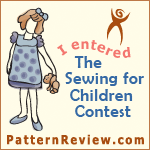 I used covered buttons in the same blue fabric as the ruffles and pocket binding. I had some difficulty deciding what to do with the pockets and ultimately just went with a simple pleated pocket with piping and binding at the top. Many thanks to Kathy Dykstra for the help with that. The ruffles at the bottom were also a challenge, since this dress is lined. And there is a technique to turning it right side out which made it problematic for the ruffle. I ultimately just whipped the lining to the dress bottom at the ruffles. The Lillian buttons down the back but I totally didn't get pictures! So sorry. I really wanted ruffles on the pockets, and I think these turned out okay. I have another idea for that next time that I think will work much better. I chose not to add the pleat to this one. I was so over these dresses and wanted to get them finished, so I can get them shipped to Illinois. I am happy to answer any questions. Feel free to post comments below.